Of course, Avamar NDMP Accelerator is nothing but a Linux server installed RedHat 4 distribution (or compatible) with the installed packages AvamarClient-Linux and AvamarNDMP-Linux. These packages can be downloaded by going to https://avamar_server and in the section “Documents & Downloads” looking for NDMP position. Put Avamar server name, and the domain where register the client (defaults is “clients”). If everything goes correctly, in the Avamar Server GUI we can see NDMP client and all active shares. And all this, in a further step proceed with NDMP as with any other client. 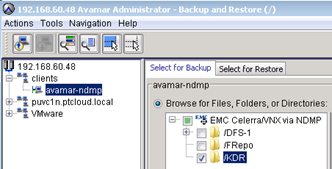 Performing backup to EMC Celerra snapshot is executed (function SnapSure) of a given file system. If in a given file pool has no free space we can meet up with a “NDMP: SnapSure file system creation fails.” message. As you can see, out of space, now go to Control Station GUI and increase the amount of space in the file pool.